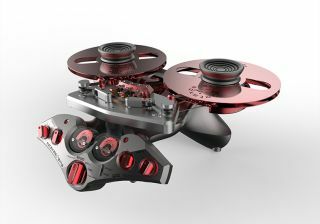 Metaxas & Sins to launch open reel tape recorder at Munich 2018 | What Hi-Fi? M & S has brought its unique design language to bear on the latest ancient audio format to enjoy a renaissance. Forget vinyl - the format's been an underground touchstone for so long now, the term 'vinyl revival' is bandied about on daytime TV. No, if you want the authenticly hip audiophile experience, open reel tape is the format to rhapsodise over. Demand for serviceable decks has risen sharply in recent years (although admittedly from a vanishingly low base), and now Metaxas & Sins is poised to enter the fray with a brand-new alternative: the GQT. Like all Metaxas & Sins products, the GQT is a limited-edition, hand-made product that hasn't let Kostas Metaxas' quest for "the whole musical truth" get in the way of some startling design flourishes. The company has worked closely with Swiss open reel hero Stellavox to create the GQT, using its SM8 as a jumping-off point. It's an indication of how close the collaboration has been that 'GQT' stands for Georges Quellet Tribute - Quellet is the founder of Stellavox. The GQT is a 0.25in analogue tape recorder, running at 15in per second. It's a purely mechanical device - there are no logic controls or computer-operated components. Metaxas is unequivocal about the superiority of open reel recorders: "there's no doubt the absolute best 'source' for reproduced music is analogue tape, and reel-to-reel analogue tape recorders are the best way to record and capture music, bar none. That is a fact, not open for discussion". Metaxas & Sins is not currently forthcoming about the price, or indeed the quantity, of the GQT. But given it intends to launch the recorder at the Munich High End Show later this month, we hope to be able to bring you more details from the show-floor.